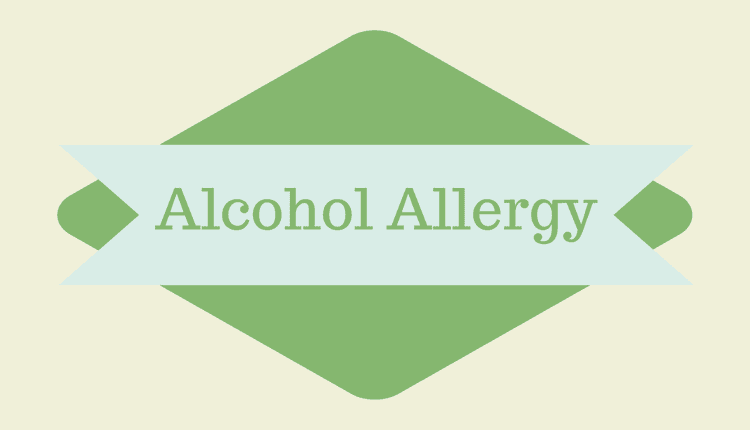 Alcohol allergy is an allergic reaction to alcoholic drinks. Though such an allergy is rare, its reactions can be quite severe. The most common alcoholic drink, which is likely to trigger symptoms is red wine. Consumption of even a minimal amount of alcohol causes unpleasant reactions. Intake of alcohol increases the release of immunoglobulin E in individuals who are allergic to it. Immunoglobulin E are antibodies produced by the immune system in response to threats. Individuals with alcohol allergy must completely abstain from alcohol intake. An enzyme named ‘aldehyde dehydrogenase’ is required for the breakdown and absorption of alcohol. Deficiency of such an enzyme impairs alcohol breakdown and leads to the buildup of toxic substances in the body. These substances trigger the immune system, causing allergic reactions. For example: – If an individual with grape allergy consumes red wine, he may have undesirable allergic reactions. Evidence-based studies have found that sensitivity to wines may be due to pharmacological intolerances to biogenic amines and sulfite additives, a preservative used in making of wines. These non-alcoholic components present in alcohol may cause allergy-like reactions in individuals who are sensitive to it. Intake of certain drugs with alcohol can inhibit the effect of enzyme- aldehyde dehydrogenase, which is needed by the body for the breakdown of alcohol. Salicylate is a chemical present in wine. Individuals sensitive to such a chemical may have harmful reactions after wine consumption. If you observe any signs or symptoms after consuming alcohol, you need to visit your doctor immediately. He will further guide you about how to detect the cause of your symptoms. Allergy testing must always be done under medical supervision. Blood test: In individuals with alcohol allergy, the level of immunoglobulin E increases after alcohol consumption. A blood sample with a high amount of immunoglobulin E can measure your immune system’s response to alcohol. Skin prick test: During this test, your doctor pricks your skin using a lancet and a drop of allergen is applied to your skin. The doctor then observes the reaction of your skin to the allergen. Redness of the skin or the presence of bumps on the skin is an indicator that you may be allergic to alcohol. Oral challenge test: In some cases, your doctor may ask you to consume a sample of alcohol. Your doctor then observes the symptoms you develop. Self-description of the symptoms: Describing your doctor about what you ate or drank and telling him about your signs and symptoms and medical history will give him a better picture of your physical condition. Being of Asian descent: Asians are at an increased risk of having alcohol allergy because they have a decreased ability to metabolize acetaldehyde, a compound formed by the breakdown of alcohol. If an individual has true alcohol allergy, complete abstinence from alcohol is the only solution. If you are allergic to a specific component of alcohol, switching to a different beverage might work for you. For example, grapes are found in wine, but not beer. So, a person allergic to grapes cannot consume wine but can consume beer. If you are allergic to alcohol, it is best to avoid it completely. Besides this, avoid food items that contain even trace amount of alcohol. Always check the ingredient list before purchasing food items. Individuals with alcohol allergy must avoid beauty products and mouthwashes containing alcohol.